Setup: The game is for 2-10 players, ages 7 and over. Every player starts with seven cards, and they are dealt face down. The rest of the cards are placed in a Draw Pile face down. Next to the pile a space should be designated for a Discard Pile. The top card should be placed in the Discard Pile, and the game begins! Game Play: The first player is normally the player to the left of the dealer (you can also choose the youngest player) and gameplay usually follows a clockwise direction. Every player views his/her cards and tries to match the card in the Discard Pile. You have to match either by the number, color, or the symbol/Action. For instance, if the Discard Pile has a red card that is an 8 you have to place either a red card or a card with an 8 on it. You can also play a Wild card (which can alter current color in play). If the player has no matches or they choose not to play any of their cards even though they might have a match, they must draw a card from the Draw pile. If that card can be played, play it. Otherwise, the game moves on to the next person in turn. You can also play a Wild card, or a Wild Draw Four card on your turn. Note: If the first card turned up from the Draw Pile (to form the Discard Pile) is an Action card, the Action from that card applies and must be carried out by the first player to go (as stated, it is usually the player to the dealer’s left). The exceptions are if a Wild or Wild Draw Four card is turned up. If it is a Wild card, Mattel has now stated that the first player to start (usually the one on the dealer’s left), can choose whatever color to begin play. If the first card is a Wild Draw Four card – Return it to the Draw Pile, shuffle the deck, and turn over a new card. At any time, if the Draw Pile becomes depleted and no one has yet won the round, take the Discard Pile, shuffle it, and turn it over to regenerate a new Draw Pile. There are two different ways to play regarding drawing new cards. 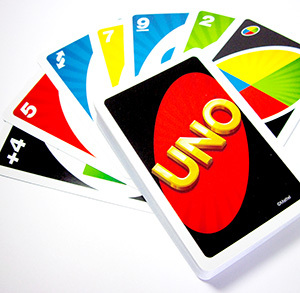 The Official Uno Rules states that after a card is drawn the player can discard it if it is a match, or if not, play passes on to the next player. The other type is where players continue to draw cards until they have a match, even if it is 10 times. The game continues until a player has one card left. The moment a player has just one card they must yell “UNO!”. If they are caught not saying “Uno” by another player before the next player has taken their turn, that player must draw two new cards as a penalty. Assuming that the player is unable to play/discard their last card and needs to draw, but after drawing, is then able to play/discard that penultimate card, the player has to repeat the action of calling out “Uno”. The bottom line is – Announcing “Uno” needs to be repeated every time you are left with one card. Once a player has no cards remaining, the game round is over, points are scored, and the game begins over again. Normally, everyone tries to be the first one to achieve 500 points, but you can also choose whatever points number to win the game, as long as everyone agrees to it. Action Cards: Besides the number cards, there are several other cards that help mix up the game. These are called Action or Symbol cards. Reverse – If going clockwise, switch to counterclockwise or vice versa. It can only be played on a card that matches by color, or on another Reverse card. If turned up at the beginning of play, the dealer goes first, and the player to the dealer’s right is next (normally it would be the player to the dealer’s left). Skip – When a player places this card, the next player has to skip their turn. It can only be played on a card that matches by color, or on another Skip card. If turned up at the beginning of play, the first player (to the dealer’s left) loses his/her turn. The next player to that player’s right starts the game instead. Draw Two – When a person places this card, the next player will have to pick up two cards and forfeit his/her turn. It can only be played on a card that matches by color, or on another Draw Two. If turned up at the beginning of play, the first player draws two cards and gets skipped. Wild – This card represents all four colors, and can be placed on any card. The player has to state which color it will represent for the next player. It can be played regardless of whether another card is available. If turned up at the beginning of play, the first player chooses what color to continue play. Wild Draw Four – This acts just like the wild card except that the next player also has to draw four cards as well as forfeit his/her turn. With this card, you must have no other alternative cards to play that matches the color of the card previously played. If you play this card illegally, you may be challenged by the other player to show your hand to him/her. If guilty, you need to draw 4 cards. If not, the challenger needs to draw 6 cards instead. If turned up at the beginning of play, return this card to the Draw pile, shuffle, and turn up a new one. In recent years, Mattel has introduced two new Action card types to Uno. Instead of 108 cards, Uno now has 112 cards. What do these 4 extra cards do? Note: You can still play classic Uno without them by simply removing them before you start the game. Wild Swap Hands Card – This is a powerful card that enables you to swap the cards in your hand with anyone of your choice. Being a Wild card, it has the same attributes, namely, you can choose to either play it or not, at any of your turns, and also choose the color of play. Ideally, you would probably want to swap your cards with the player who has the least number of cards! Being a powerful Action card, only one is provided per deck. If turned up at the beginning of the game, the first player to start gets to choose the color and also swap his hands with another person. Wild Customizable Card – There are 3 of them provided in any deck, and they are all blank. These are meant for you to write down your own “house rules”. Before the game starts, make sure everyone agrees to the rules and also on how many of the Wild Customizable cards will be used. You can use 1-3 of them per game. These are Wild Cards, so the same rules apply to them – The person who plays them gets to choose the color of play, and if turned up at the start, then the first player chooses the color of play. 3 new Wild blank customizable cards and 1 Swap Hands card. What house rules can you make up? Mattel says it’s up to your imagination, but of course it has to be something everyone agrees with. These blank customizable cards were introduced by Mattel to add a huge dash of unpredictability and extra fun to the game. Although the cards are erasable and you can write on them with a pencil, but if you are worried that the cards would wear out quickly, one suggestion is to use a detachable plastic sticker and write on the sticker instead, and then lightly stick it onto the card for the duration of the game. What if your last card is a Wild Swap Hands? This scenario may happen from time to time. If your last card is a Wild Swap Hands card, you can treat it like a normal Wild card and play it to end the game right there and then – No further action is required. This is because you would obviously not win the game if you were required to swap your hand with another player. The next player needs to do 3 sit-ups and if he/she fails or refuses, then draw 3 cards. Everyone but you must draw 2 cards immediately. Everyone must immediately discard their Wild cards. Everyone but you. Call out the color you want. Then act or play a charade, and the first player who correctly guesses it can discard all the cards of that color that they have in hand at that moment. Everyone skips a turn, or rather, you take an extra turn. Scoring: When a player no longer has any cards and the game ends, he/she receives points. All opponents’ cards are given to the winner and points are counted. All number cards are the same value as the number on the card (e.g. a 9 is 9 points). “Draw Two" – 20 Points, “Reverse" – 20 Points, “Skip" – 20 Points, “Wild" – 50 Points, and “Wild Draw Four" – 50 Points. “Wild Swap Hands” – 40 Points, “Wild Customizable card” – 40 Points. The first player to attain 500 points wins the game. This is the alternative Uno gameplay proposed by Mattel. This is done by keeping a running tally of the total points left in each player’s hand at the end of each round. Players reaching 500 points (or any designated amount) are slowly eliminated until only two are left. The final two players then challenge each other (under Two Player rules) until someone reaches 500 points and loses. If you play a Draw Two or Wild Draw Four card, your opponent has to draw the number of cards required, and then play immediately resumes back on your turn. For four players (two-partner teams), players sit opposite their partners, and play until one of either partner goes out with one Uno card left. Scoring for the winning team is done by adding up all the points from opposing partner’s hands.